When in Copenhagen, do as the locals do: get around the city by bicycle, wear multiple layers in your favorite shade of black, and be sure to eat some undeniably hip porridge. While hot bowls of grain often translate simply to morning oatmeal in the United States, they can be an all day affair in Scandinavia. Think beyond oats: congee, risotto, quinoa, dal, and more can be the basis for a bowl of porridge. At Copenhagen’s Grød (“porridge” in English), all of the above are gluten-free and in regular rotation amongst the café’s seasonal offerings. Keep an eye out for “glutenfri” on the menu, and don’t hesitate to ask the friendly staff if you have any questions. And don’t forget to add some tasty Scandinavian toppings, like pickled mushrooms, roasted hazelnuts, or ginger syrup—though probably not all at once. 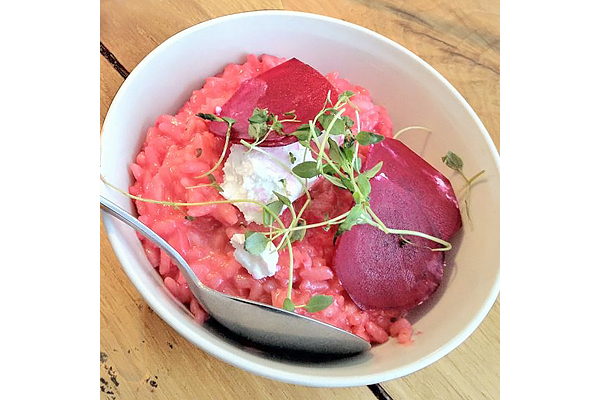 The gluten-free beet risotto that we tried served as a deliciously savory and hearty meal. Though risotto can be simple, this version was made satisfyingly complex with the lightness of the beets and richness of the goat cheese. Grød is typically open from breakfast through dinner, but arrive as early as you can. The café’s communal tables in its tiny-but-lovely minimalist dining room fill up quickly! Pre- or post-porridge, take a stroll through Grød’s Nørrebro neighborhood, along Jægersborggade. It’s a fascinating block packed with similarly cool Nordic restaurants (Manfreds), small design shops (Uh la la Ceramics), bakeries (Meyer’s Bakery), sweet shops (Karamelleriet), and coffee houses (Coffee Collective). If you find yourself in need of a gluten-free sweet to finish your meal, just hop over the bridge to Andersen Bakery, right outside of historic Tivoli Gardens. Where? Grød is located in Nørrebro: Jægersborggade 50, Copenhagen (+45-50-58-55-79). I’m heading to Copenhagen for a day trip next month so I will definitely checking out this recommendation. Hi Kel! Enjoy, and please post pictures. I recommend going for breakfast and staying for lunch! Hi Anwar! Jægersborggade is kind of hidden but definitely worth seeking out. Great food and amazing Copenhagen sidewalk cafe culture! That beet risotto looks wonderful! Copenhagen is one of my favorite cities in Europe, I loved going to the small cafes and indulging in perfect salads. Will you be going back during your world tour? Hi Jessica! Yes, Copenhagen might even be our first stop in Europe this fall. I would love your recommendations for salad spots—sounds like the perfect complement to a sidewalk table and people watching.